Düsseldorf - The dust has barely settled on the midweek programme, but the Bundesliga is already gearing up for the next round of action. Matchday 15 commences on Friday evening with a tasty-looking clash between two of the newly promoted sides, as Fortuna Düsseldorf hoist Eintracht Frankfurt at the ESPRIT Arena (kick-of 20:30 CET). Few would have anticipated it at the beginning of the campaign, but these two sides currently have altogether divergent agendas, as one looks to edge further clear of the drop zone while the other seeks to get its European bid back on track. Düsseldorf lie 14th in the table with a three-point cushion over the relegation play-off place, and a win would be most welcome for the Flingeraner, who are coming back into a bit of form after a decidedly sticky spell. A 2-0 success over Hamburger SV last weekend, the club’s first home win at the seventh time of asking, was then followed by a brilliant display at champions Borussia Dortmund, where they sneaked a point. Not since the heady early days of the season, which saw them climb as high as fifth on Matchday 5, on the back of a rock-solid defence, has confidence been so high among Norbert Meier’s squad. Frankfurt on the other hand are flying high in seventh, having astonishingly won half of their 14 games, when many were predicting a relegation scrap for Armin Veh’s men. Tuesday's 3-1 defeat against 1.FSV Mainz 05 was just their first home loss of the season, and their previous away day yielded a creditable draw at FC Schalke 04. The Eagles are also yet to have their wings clipped in two consecutive games so far this campaign. Chief among the attributes that Fortuna will have to call upon is industry. It has been one of their defining traits all season and in recent weeks, fewer players have been more industrious than Australian international Robbie Kruse. The winger made more sprints than any other player (28) and covered just over 12km in the draw at Dortmund. He played only a handful of games when Fortuna reached the top flight last season, but is looking increasingly like one of the figures upon whom their survival bid will hinge this year. 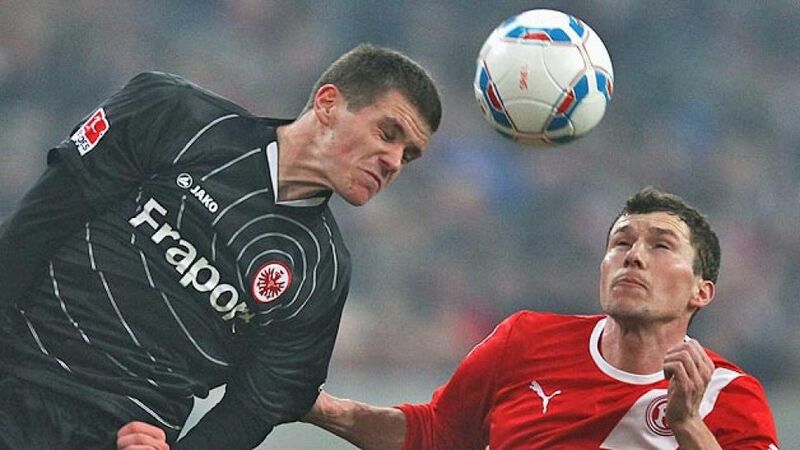 Frankfurt's answer to Kruse is Alexander Meier. The gangly attacking midfielder has been one of the Bundesliga's sensations this season. Now in his eighth season at the club, he has been one of the main contributors to their lofty league position, with nine goals in 14 league appearances. Having experienced the club’s flitting between the Bundesliga and Bundesliga 2 in recent years, few would begrudge his maturing into a player made for the highest level at the ripe old age of 29. Recent history between the two sides suggests a share of the spoils could very well be on the cards. Four of the last five encounters have ended in draws, including both games last season, while Fortuna have also finished all-square in four of their seven home matches this term. At the end of a gruelling week's action though, perhaps neither coach would sniff at what would surely be a hard-earned point.